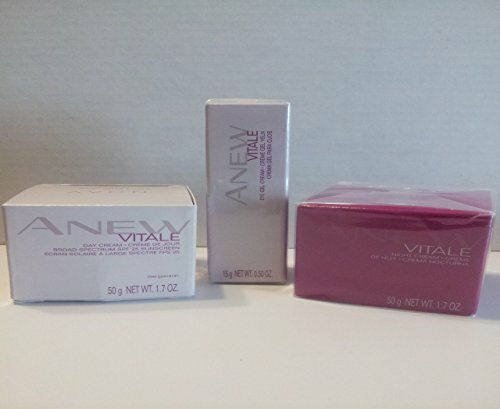 Introducing Anew Vitale, powered by VitaToneComplex. Revive tired-looking skin after just one use. Now you can visibly reduce dullness, improve clarity and restore the well-rested look of a full-night's sleep. Suitable for all skin tones. 1.7 oz. net wt. Look like you had 8 hours of sleep, even when you didn't! Anew Vitale Night Gel Cream helps renew and energize dull, overtired skin. Hydrating gel cream, with ProEnergy Complex, is formulated to help strengthen skin's foundation. Anew Vitale Night Gel Cream helps provide a youthful-looking appearance by off-setting the look of fatigue on skin. Over time, the appearance of fine lines, enlarged pores, skin dullness and fatigue virtually disappears. To Use: In the evening, massage gently over cleansed face and neck. 1.7 oz. net wt. Wake up tired looking eyes and look refreshed and well rested all day. Anew Vitale Eye Gel Cream helps skin look energized and fight the signs of fatigue in the eye area. Hydrating gel cream, with ProEnergy Complex, is formulated to strengthen skin's foundation and reduce the damage that can lead to puffiness. Over time, the appearance of fine lines, dullness and fatigue virtually disappears. Skin around the eye area looks as if it has new life. To Use: In morning and evening, apply to upper eyelid, under eye area and along crow's feet. Suitable for all skin tones. 100% of women showed improved radiance around the eye area over time. Hypoallergenic. .5 oz. net wt. Look like you had 8 hours of sleep, even when you didn't! Anew Vitale Night Gel Cream helps renew and energize dull, overtired skin. Hydrating gel cream, with ProEnergy Complex, is formulated to help strengthen skin's foundation. Anew Vitale Night Gel Cream helps provide a youthful-looking appearance by off-setting the look of fatigue on skin. Over time, the appearance of fine lines, enlarged pores, skin dullness and fatigue virtually disappears. To Use: In the evening, massage gently over cleansed face and neck. 1.7 oz. net wt. Wake up tired looking eyes and look refreshed and well rested all day. Anew Vitale Eye Gel Cream helps skin look energized and fight the signs of fatigue in the eye area. Hydrating gel cream, with ProEnergy Complex, is formulated to strengthen skin's foundation and reduce the damage that can lead to puffiness. Over time, the appearance of fine lines, dullness and fatigue virtually disappears. Skin around the eye area looks as if it has new life. To Use: In morning and evening, apply to upper eyelid, under eye area and along crow's feet. Suitable for all skin tones. 100% of women showed improved radiance around the eye area over time. Hypoallergenic. .5 oz. net wt.